Lifestyle changes are the cornerstone of preventing and treating non-alcoholic fatty liver disease (NAFLD). Scientists report success in using web-based intervention to manage lifestyle changes in patients with NAFLD in a new six-year single-center study comparing group-based and web-based interventions. Their results are published in the Journal of Hepatology. NAFLD is becoming a major global public health problem in parallel with epidemics of obesity and diabetes, and the costs associated with liver disease of metabolic origin and its complications are soon likely to outweigh the costs of liver diseases of viral origin. Clinical practice guidelines, including the recent EASL guidelines shared by the Liver, Diabetes and Obesity Societies, recommend lifestyle changes to prevent and treat the disease. However, participation of NAFLD patients in structured lifestyle programs may be jeopardized by job demands, distance from treatment center, and time constraints. Investigators hypothesized that using an Internet-based approach to educate, counsel, and induce permanent changes in motivated and engaged NAFLD patients would expand lifestyle intervention to a much larger community, reducing attendance to busy liver units and sparing patients’ and physicians’ time. The study was designed to measure the two-year effectiveness of a web-based educational intervention aimed at lifestyle changes, including healthy diet, habitual physical activity, and weight loss in individuals with NAFLD. “Lifestyle changes are pivotal for the treatment of NAFLD. The use of web-based education tools in the management of non-communicable diseases has long been suggested, considering the huge number of cases at risk and patients’ needs. Web-based programs might help maintain contact between patients and therapists, since the majority of cases are in an age range in which job constraints make it difficult to use a systematic face-to-face or group approach,” explained lead investigator Giulio Marchesini, MD, “Alma Mater” University, Department of Medical and Surgical Sciences, S. Orsola-Malpighi Hospital, Bologna, Italy. Investigators translated their validated group counseling program (five sessions carried out in groups of 15-20 patients at fixed days and hours) into a web-based program accessible by user ID and password, allowing remote interaction with the center. More than 700 consecutive NAFLD patients with a mean age of 52 were treated in the Unit of Metabolic Diseases and Clinical Dietetics at the University of Bologna from January 2010 to December 2015 with structured programs. One third of all patients had type 2 diabetes. The primary aim was to reduce weight by ten percent. The established group-based protocol included motivational interviewing and a group-based intervention chaired by physicians, dietitians, and psychologists (five weekly meetings). Patients who could not attend the group-based intervention entered the web-based intervention that included interactive games, learning tests, motivational tests, and email contact with the Center. 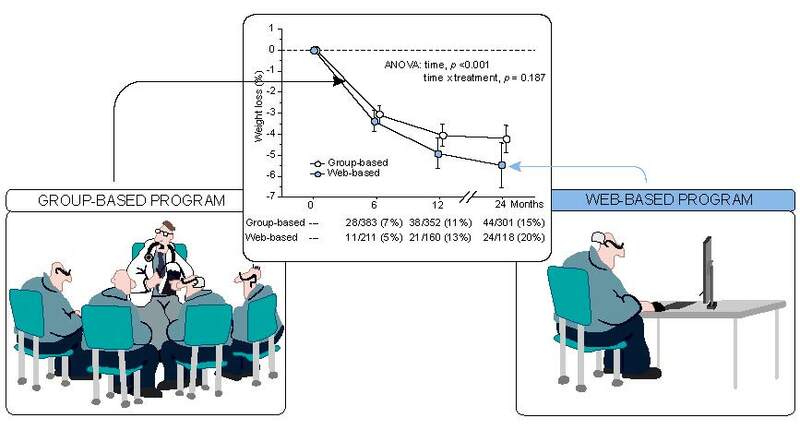 All patients were seen every six months and the anthropometric and clinical parameters of 278 cases entered in the web program were compared with those of 438 patients attending the regular group-based educational program. The two groups were comparable in terms of obesity, but the web intervention group was characterized by younger age, higher prevalence of males, and higher education. Percent weight loss over two years in the two groups treated by either group-based or web-based educational programs. The study concluded that a web-based, interactive intervention coupled with a face-to-face meeting every six months is as effective as a standard group-based intervention. After two years the probability of reaching the primary outcome of ten percent weight loss was similar in both groups although with a higher attrition rate in the web program. Liver enzymes decreased in both groups and normalized more frequently in the web-treated group. Dietary intake was reduced, and physical activity increased in both groups. Steatosis (buildup of fat within the liver) and fibrosis (the accumulation of scar tissue), which are markers of NAFLD, were evaluated during the study period by non-invasive markers. Steatosis was reduced in both groups, and fibrosis remained stable or decreased without differences between groups. The article is “An internet-based approach for lifestyle changes in patients with NAFLD: Two-year effects on weight loss and surrogate markers,” by Arianna Mazzotti, Maria Turchese Caletti, Lucia Brodosi, Silvia Di Domizio, Maria Louisa Forchielli, Salvatore Petta, Elisabetta Bugianesi, Giampaolo Bianchi, and Giulio Marchesini (http://dx.doi.org/10.1016/j.jhep.2018.07.013). It will appear in the Journal of Hepatology, volume 69, issue 5 (November 2018) published by Elsevier. Full text of this article is available to credentialed journalists upon request, contact Carolien van der Zanden at +31 20 485 3346 or hmsmedia@elsevier.com. Journalists wishing to interview the study authors should contact Prof. Marchesini at +39 051 2144889 or giulio.marchesini@unibo.it. This study was supported by a European Community FP7 program FLIP (Fatty Liver: Inhibition to Progression).